Relating power to detail. How much is enough? I'm looking for more detail in my 2 channel music. Mainly vinyl. The vintage McIntosh MC2505 50watt amp I am using sounds good but I am wanting to step up to the next level so to speak. Please don't turn this into a cartridge, turntable, preamp or speaker wire debate . I understand all of that. I'm wondering if there is a point where you can have too much or "wasted" power in regards to headroom and clean volume, relating to a specific speaker, listening at reasonably loud volume. Granted, testosterone dictates that you can never have too much power but really, where is the break even point? I'm interested in electrical algorithm type answers, not "use whatever sounds good to you" or name brand debates. For reference I'm using the original RF-7's and considering an amp advertised at 300 wpc RMS. The speaker sesnsitivity is 102dB @ 2.83 volts/1 meter. 300wpc sounds like a lot to me but I see where some people use 1000 watt monoblocks. Is that much power an advantage to detail or is it overkill? I have cranked mine up and have never been able to get it above 20 Watts per the meter as it just becomes too loud and the neighbors start texting the wife... I feel that I have an extra 180 untapped watts that I may never use. Mine speakers are a similar 103dB. I think I could/would be perfectly happy with a 50 or 100 watt Mac. I will say I am very happy with my set up, I am looking at purchasing a second Mcintosh amp, just trying to figure if a smaller cheaper version (MC2105 or your MC2505) would suffice. Too bad we couldn't swap for a week... if your thinking of replacing your McIntosh with a newer class D, I can say I like my Mcintosh a lot better than both my Rotel and Sunfire class D monster amps. Don't focus on wattage, look at the dynamic headroom (how many db available), dampening factor, the higher the number the better (ability to quickly stop and start the woofer), S/N Ratio (over 100, 110db or better is great), dual power transformers, large energy storing caps, high power rails, 2 ohm or less stability. Wattage output measured at 1Khz is useless. All this typically leads to better overall dynamics and transient response. 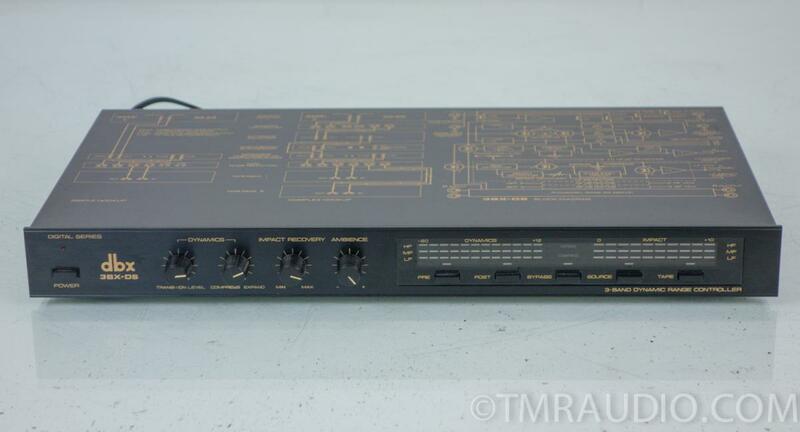 Here are the specs on one of the best amplifiers that I have owned. They are rare but can be found. I am also a fan of the older Yamaha's M-80, M-85, MX-1000. Old Luxman amps, Onkyo M-506 or M-508. Another option since you use vinyl is to use a DBX Dynamic Range Controller such as the 3BX-DS. These are incredible units if used properly. They can bring out levels of detail and impact you never thought possible. what is it that you are after? Can you explain to me what you seem to think is the correlation between detail and power? As far as I am concerned the two have little to nothing to do with one another. If you want mo detail the only place to get that is at the source. So if you are running a player you need a better CD player or if a Transport/DAC then I would start with a better transport then DAC and finish off with a top sounding Digital cable. Best regards Moray James. Unused power is unused, but given the transient demands of music and the logarithmic relation of spl to power, it's better to have too much than not enough. Considering the quality of your (OP's) rig as is, you will likely get more detail in your two channel music by addressing the acoustics of the room. Ideal speaker placement, a couple diffusors here, a couple bass traps there, and voila. It would do wonders in the detail and clarity department. what is it that you are after? Can you explain to me what you seem to think is the correlation between detail and power?. Considering the quality of your (OP's) rig as is, you will likely get more detail in your two channel music by addressing the acoustics of the room. Yes I'm afraid thats going to be a better answer for what I'm looking for. Room acoustics is a black hole to me. Don't even know where to start. You need to try one of these! Cheap enough and you can resell it easily if you don't like it. This will give you all the Dynamics and Impact using your present gear. Use in your tape monitor loop. There are a number of folks on here with one. I think this is right on target, and that there is NO correlation between power and clarity. Some of the clearest sound I've heard has been from flea=powered SET amps -- until even medium-power demands cause them to sound congested. My OTL mono blocs (100 w. each) are also among the more detailed amps I've heard. In my experience, as Moray says, detail comes from better sound sources. As he says, in the digital arena, a better transport and especially a better DAC will go a long ways. Computer internal DACs are pretty weak, so I'd suggest an external DAC. The Dragonfly is very good, very convenient to use, not very expensive, and takes up almost no added space in your equipment. You can spend a lot more, but it's like having still another component in your rack. In the analog realm, like it or not, you will have to get into carts, maybe turntables and/or tonearms. You need to tell us what you have in order for us to help you. Although LOMC carts are probably the most detailed, I'd suggest you stick to MM. One of the best seems to be the Ortofon 2M Black (I think that's the right name). Others should suggest TT and arm candidates, since I think mine are probably too pricey. Here again, you need to tell us what you have so we know where to start. Maybe the cause will be obvious once we know what you have. Bottom line: you need to figure out what the problem is. I can assure you -- it's NOT the amount of"power" by itself. If you really want to start down the acoustics rabbit hole but don't want to scour the interwebs for second hand info, get Toole's book Acoustics and Psychoacoustics of Speakers and Rooms (not the end all source, but an excellent introduction), and some sort of rta gear (REW plus a calibrated mic is the cheapest, and amazingly full featured). It's not as intimidating as you may think, and the dividends are huge. An added thought: I and many here consider tubes to provide the clearest sound. Agreed, tubes are the icing on the cake. Ok I have learned I don't know as much as I thought I did....... as usual. I will reconsider the bigger amp and do some more homework. Yes tubes have always been on the bucket list. I am currently using a Pro-Ject turntable with the Ortofon Red. Hard to spend money on a catridge that cost $700, as the Black Ortofon does, without being able to hear it first. I miss the days of high end audio stores that actually carried inventory and offered demos. Also realize that at 48 years old and a long list of rock concerts in my past it may be my ears that are actually the limiting factor. I know when I shop for an amp, I look at dynamic range and distortion figures before I go to any other area of the specification sheet. Detail relates to information the more you can extract from your source the better your system will sound. Power relates (in part) to dynamics these are not the same thing. You can gain better dynamics in two ways you can increase the size of your amp but this is going to be limited at some point (usually quickly) by your loudspeaker or you can lower the noise floor of your system and your room will most to do with that. Having a high efficiency speaker as in over a hundred db is the best way to go as it is far less expensive than compared to buying large amplifiers. When I was talking about your speaker being the limit this is what I was talking about. Lets say your speaker is capable of handling 100 watts continuous. Well once you reach about 33 wats continous the voice coil will start to get really hot so much so that its DC resistance will start to go up so you have to apply more power and so on until you limit at 100 watts continuous (assuming the manufacturer was telling the truth and they love to stretch the truth). So way back down at 33 watts continous you started to get into what is known as thermal compression. The end run is that you dont really want to ever get into thermal compression you want to design/buy a system that delivers the levels you want and does not get into thermal compression. Thats is where high efficiency works so well for home systems. The problem is that high efficiency systems are going to be on the large size and that is just the way it is. Hope this helps you some. Best regards Moray James. Also realize that at 48 years old and a long list of rock concerts in my past it may be my ears that are actually the limiting factor. I can relate to that being 48 myself. The late 70's and 80's attributed to my tinnitus and slight hearing loss. My take on all of this, which I agree with for the most part, is like my analogy of designing/selling/installing home and car audio video for 20 years and being a manufacturers rep for 9 years. What I was taught by my mentors, and a known fact, is "trash in, trash out". $10,000 of gear behind an AM radio is going to sound like a loud *** AM radio. Now, yours source gear is quite nice so I'm not implying that whatsoever. I think you're on the right track looking at room acoustics being an issue and is typically THE most overlooked. I'm looking for more detail in my 2 channel music. Mainly vinyl. The vintage McIntosh MC2505 50watt amp I am using sounds good but I am wanting to step up to the next level so to speak...I'm wondering if there is a point where you can have too much or "wasted" power in regards to headroom and clean volume, relating to a specific speaker, listening at reasonably loud volume...I'm interested in electrical algorithm type answers, not "use whatever sounds good to you" or name brand debates. Question: How did you equate detail with power? In my experience, detail comes from one thing: very low modulation distortion-- in amplifiers and in loudspeakers. If you are looking for low modulation distortion in amplifiers, I'd actually recommend higher quality tube-type amplifiers, or alternatively, one- or two-stage FET amplifiers using minimal feedback (i.e., lowering the production of higher order harmonics by th amplifier). First Watt makes excellent designs in the latter category. Your RF-7s fall in between the Cornwall and the Heresy in terms of efficiency - closer to a Cornwall. You can bound the input power requirements by looking at those two columns. I think the TS needs to go down the rabbit hole and get the acoustics ironed out for his room before looking at amps. IMO treating the room can make a bigger difference than buying a new amp and not treating the room. I'm looking for more detail in my 2 channel music. Mainly vinyl. The vintage McIntosh MC2505 50watt amp I am using sounds good but I am wanting to step up to the next level so to speak. I also use my RF 7 speakers for 2 ch. Power is not the issue, I had a Yamaha M 80 and several other amps on the RF 7's. To blast music, the meter never went much beyond 20 watts in a large family room open to other areas. Currently, I am also looking to improve clarity and detail. Today I started making acoustic panel and may add some diffusers. I have heard great systems that don't use high powered amps. The source, speaker, DAC, ect will help further tweak out more detail and clarity. This hobby quickly becomes an endless money blackhole, lol. If power is not the issue then tell me what constitutes having 1000w mono block home systems? They are surely not playing louder than we are without their ears bleeding. Are some speakers just that power hungry? I spend a lot of time surfing high end systems and many of those mega watt amps are in rooms no bigger than my 19x24 room.